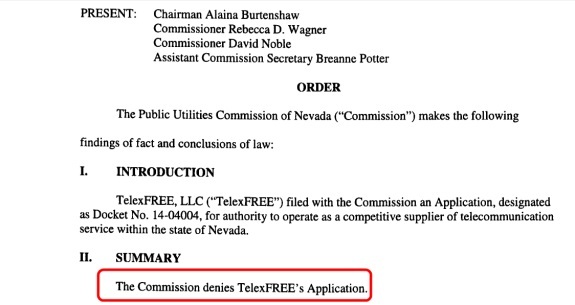 The Nevada Public Utilities Commission has rejected TelexFree’s telecom application. Image source: PUC document. Red highlight by PP Blog. Nevada, the state in which TelexFree operated an alleged $1.2 billion pyramid- and Ponzi scheme through a mailbox and filed its initial Chapter 11 bankruptcy petition, has rejected the company’s application to become a telecom provider. The Nevada Public Utilities Commission denied the application in an order dated June 2. The staff of the PUC pressed for the denial last month, noting that TelexFree filed for the license on April 1 but then declared bankruptcy only 12 days later. The staff also said it was aware TelexFree had been charged civilly with fraud by the U.S. Securities and Exchange Commission and that its assets had been frozen. At the same time, the staff said it was aware TelexFree also is the subject of state-level civil action by the Massachusetts Securities Division. Former TelexFree President James Merrill currently is jailed on a criminal charge of wire-fraud conspiracy. That charge was filed May 9. Merrill continues to seek his release on bail. Carlos Wanzeler, Merrill’s TelexFree business partner, also was charged criminally with wire-fraud conspiracy last month. U.S. federal prosecutors have described him as an international fugitive. A U.S. Bankruptcy Judge in Nevada transferred the TelexFree petition to Massachusetts last month, after the SEC argued the state was TelexFree’s nerve center. Litigation against the firm is centered in Massachusetts, although a prospective class-action lawsuit against TelexFree and alleged managers, promoters and vendors also has been filed in federal court in the Eastern District of North Carolina. At least two civil actions against TelexFree, including the one in North Carolina, allege violations of the federal racketeering (RICO) statute. There also is active TelexFree-related litigation in Brazil. An alleged promoter of TelexFree was arrested in Uganda last month and paraded in front of TV cameras. In the United States, the SEC has referred to a number of TelexFree-related promos on YouTube. HYIP schemes are notorious for using social media to gain a head of steam. The actions by various governments and private litigants show that promoters are not insulated from prosecution and can become defendants in cases that allege fraud. With its assets frozen, whether TelexFree has the resources to address lawsuits and licensing challenges in multiple jurisdictions remains an open question. Individual promoters named in complaints could rack up high legal bills, with the company unable or unwilling to provide assistance. Because some of the actions name “Doe” defendants, it is possible that other TelexFree promoters will find themselves with the need to hire attorneys at their own expense. Named promoters so far include Faith Sloan, Sann Rodrigues, Randy Crosby and Santiago De La Rosa. It is known that the U.S. Department of Homeland Security opened an undercover probe into TelexFree by at least October 2013. Precisely how many TelexFree promoters interacted with undercover agents is unclear. Hawaii just rejected them for the same reasons – government case and bankruptcy filing. More to come. They are dead in the water.